Lucky us! We made a last minute decision to stop in at Andrei’s Conscious Cuisine on a weeknight, and the weekly special menu was Chef Yves’ Favorite Things. We didn’t need to look in the regular menu! 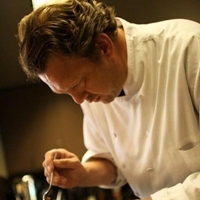 Yves Fournier is a great chef with great taste. Crushed Baby Sweet Potatoes, with Tamarind Ketchup (you can’t even imagine how good this was) AND blue cheese dip. Heavenly, crisp on the outside, like creamy mashed sweet potatoes on the inside. Steamed Clams, with coconut, ginger and saffron broth. Fresh, tender clams in a broth so good we asked for spoons and extra bread to get every last drop. We dove into this so fast, I forgot to take a picture! Beef Short Rib Tagine: Boneless Short Rib with garbanzo beans, kabocha squash, olives, raisins, dates, orange confit, pea tendrils, and a spicy almond yogurt. Susi oohed and aahed and was barely willing to push this across the table for me to taste. Great depth and wonderful seasoning. Huge portion, and we managed to take home some leftovers. French Cassoulet: Traditional French white bean stew with duck confit, lamb osso bucco, and pork sausage. Rich and decadent. But beans are good for you right? Fiber? This got finished! No leftovers. We also enjoyed two relatively new cocktails. Susan had a Circa 1932, made from Old Overholt Rye Whiskey – which if you are a Boardwalk Empire fan, is the booze factory that Nucky is restarting for Andrew Mellon. I had a PB&J, made with organic vodka, frangelico, raspberry vodka, muddled strawberry, and a salted peanut rim. 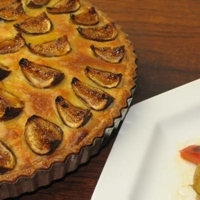 Yves has great favorites – I think they are some of mine too! Go now – this menu only through 12/22. My buddies and favorite chef couple, Yves & Elyssa Fournier of Andrei’s Restaurant in Irvine (where you will find me tonight), are featured this month in the online magazine of Melissa’s – a supplier of high quality produce and herbs to better restaurants. 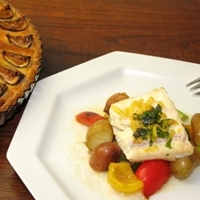 The Ingredient Challenge article features a simple sea bass dish with fingerling potatoes, and a fig tart, complete with recipes! Congrats to Yves & Elyssa! Keep up the great cooking.